This weekend I did two paintings. Both brought the issue of subject matter to the fore. One was in the San Gabriel River where I actually hiked for about 45 minutes before settling for a nice spot...which might account for why I need to finish that piece in the studio. The second one was the birdbath painting above, done during a demo at the San Gabriel Fine Art Association. The subject matter was "imposed", I mean that birdbath is exactly what was in front of me at the entrance of the gallery. I didn't bring pictures with me to paint from. SCOUT: Sometimes it is worth walking or driving a bit. But searching for the perfect spot can ruin hours of perfectly good paintings. A good spot presents itself almost every time just walking around. SQUINT: I am of the opinion that a painting is almost anywhere if the light is right. When looking for a "good" subject matter the first thing I do is squint an see where the most interesting plays of lights and shadow happen. The fame of a place is irrelevant if the light is not right. A buyer might buy a painting of a famous building or area "despite" the fact that it is uninteresting as a painting but that invariably makes the satisfaction suspect. People, dumpsters, cars, ignore what they are, just look for what makes a good composition. SCOPE: If an area is not all that interesting, I sometimes change "scope", I focus on smaller landscapes within the landscapes. Instead of painting the whole street, paint a building. instead of the building, paint the bucket and the brooms in the porch.... The birdbath above is an example of that, I am painting a small section of the building even though I am sure the light behind the wall was a lot more interesting. Recently I found some weeds in the freeway during my commute that would make a great painting. Of course because you so deftly put your words into practice and show us examples, it makes it even more meaningful. 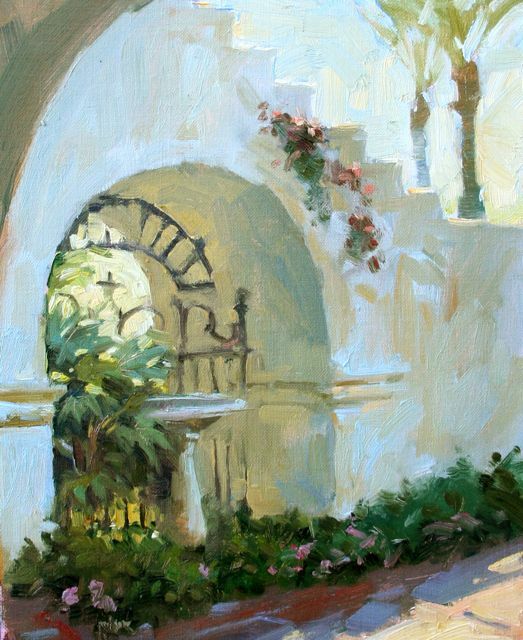 I love the wall in this painting... gorgeous light!! I found your blog by mere coincidence (by clicking the next blog post after visiting another artist's blog), and I'm glad I did.